Our aircraft seats the pilot plus one passenger at a time. You cannot place small children on your lap during a flight. You can book flights back-to-back to better share the experience. What are aerobatics and what can I expect? Aerobatics are the maneuvers that you might see an aircraft do at an air show. They have also been described as tricks or stunts. One thing for sure, they are fun. We will not just take you up and start flipping you over but the maneuvers are done with increasing intensity depending on each persons input and desires. Once you get comfortable with this new experience we can pick up the pace. Maximum weight for an aerobatic flight is 235lbs. The aerobatics that we perform must take place in a specific location and at a higher altitude than we normally fly. The following is a description of some of the maneuvers that we can perform, depending of course on the individual requests. Aileron rolls are flown with the rudder and elevator in the neutral position during the roll. The aileron is fully deflected in the direction of the roll. The aileron roll is started by pulling the nose up 20-30 degrees above the horizon. The elevator is then neutralized and the aileron fully deflected in the direction of the roll. The controls are maintained in that position until the roll is completed. After the roll is completed, the nose is usually 20-30 degrees below the horizon. This is one of the most basic maneuvers, but not very easy to fly well. The difficulty in flying this maneuver well is in correcting for the effects of wind drift. The maneuver starts with a pull-up of about 3-4 G’s. Once past the vertical, the back pressure on the elevator is slowly relaxed to float over to top of the loop to keep it round. Past the top, the back pressure is slowly increased again throughout the back part till the horizontal flight. The plane has to stay in one plane with the wings orthogonal to the flight path. A rudder is used to maintain the plane of the figure and ailerons are used to maintain the orientation of wings. The barrel roll is a combination between a loop and a roll. You complete one loop while completing one roll at the same time. The flight path during a barrel roll has the shape of a horizontal corkscrew. Imagine a big barrel, with the airplane’s wheels rolling along the inside of the barrel in a corkscrew path. During a barrel roll, the pilot always experiences positive G’s. The maximum is about 2.5 to 3 G and the minimum of about 0.5 G.
It starts with a quarter loop into a vertical climb. When the plane stops climbing, it pivots around its vertical axis (which is now horizontal). The nose moves in a vertical circle from pointing up through the horizon to pointing down. After moving vertically down to pick up speed again, the maneuver is finished with the last quarter of a loop to horizontal flight. The quarter loop is flown just the first part of a loop. When the plane is vertical, the elevator back-pressure is released completely. During the vertical line up, some right aileron and right rudder is needed to maintain the vertical attitude because of the engine torque and p-factor. When the plane has slowed enough, full rudder initiates the turnaround. It is followed by the right-forward stick (right aileron and forward elevator) to keep the plane for torquing off. The pivot is stopped with opposite rudder when the nose points straight down. When the pivot is completed, the ailerons are neutralized. Elevator and rudder are used to keep the nose pointing straight down. This maneuver is sometimes called a hammerhead stall. This is not an accurate name because the plane never stalls. The airspeed may be very slow, close to zero, but since there is now wing loading during the turn-around, there is no stall (at zero G wing loading, a wing does not stall). The plane is flying throughout the maneuver with all the control surfaces effective (although sometimes only marginally so). This figure starts with a pull to a 45-degree up-line. Centered on this line is a half roll from upright to inverted. Five-eights of a loop complete the figure to horizontal flight. This again is one of the maneuvers that have been used to reverse direction while preserving altitude and airspeed. The minimum age is around 6 years old. A child of normal stature for that age will fit safely in the seat belts and be tall enough to take in the view. There is no set maximum age limit and we have flown people who are well into their late-80’s! The only requirement is that the person be agile enough to get into the front cockpit of the aircraft and that they are in good health. The aircraft offers good protection from the elements, so dress as if you were going for a ride in a convertible. If the temperature is above 50 degrees the ride is most comfortable with a light jacket (leather is the best). In the summer months, a t-shirt and jeans are the requisite attire (even for your pilot). You should also bring sunglasses; we’ll supply the flying helmet and goggles. The maximum weight for a regular (non-aerobatic) flight is 290 lbs. For the aerobatic rides, it is 235 lbs. Call us at 970-261-4220. It will take us a minute to process your order; we can then mail it to you in a plain brown envelope or you can come by the airport and pick it up. If you need it really soon, we can email you or the recipient the gift certificate. You can also fill out the order form online and we will contact you within 24 hours to complete the order. There are a number of reasons we may cancel your flight due to the weather. Simply put, we will not take you up on a day where you will not be thrilled with your flight. Your pilot has the authority to cancel, change, or shorten a flight due to weather or other variables. If we cancel your flight due to inclement weather (at the sole discretion of Vintage Aviation, Ltd.) we will gladly reschedule your flight for the next best date. 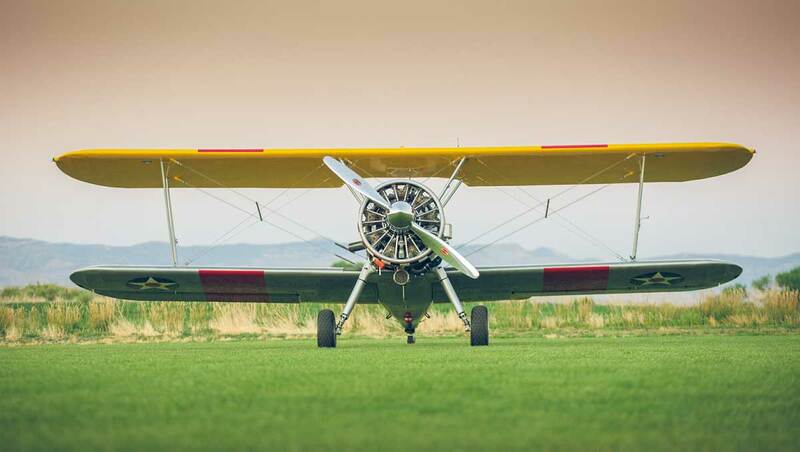 If you would like to change your ride to a longer flight or to a ride that can include aerobatics, you must tell us when you schedule your flight. Our flights are usually booked back-to-back and it is difficult for us to accommodate last minute changes. There is no charge for flights cancelled at least 48 hours in advance. However, once booked, if you cancel your flight within 48 hours you will be charged for the entire flight (this includes no shows. No exceptions). Our flights are tightly booked. If you arrive late (plan to arrive 15 minutes before your scheduled flight time), that time will be deducted from your flight. Gift certificates can be refunded within 30 days of purchase and have an expiration date twelve months after the date listed on the gift certificate. Everything in life has risk. Quite simply, your biggest risk will be driving to the airport. Safety is the only thing that takes priority over having fun. We give hundreds of flights each year and your pilot is a FAA-certified commercial pilot with thousands of hours of experience. We maintain a perfect flying safety record and our aircraft is maintained to meet the highest FAA maintenance standards. Our office hours vary. Often you’ll find us at the airport flying from sunrise to sunset. But if we’re in the air, it is difficult to talk with us. Please call us at 970-261-4220 before coming out to the airport so we may provide you with the best possible service. Do the gift certificates expire? How long are they good for? The gift certificates are valid for twelve months from the date they are given. You tell US what you would like to do. We have some “set” routes for the package that is chosen, but everything is negotiable and we are happy to accommodate our passengers whenever possible. We will typically fly along the rim of the Colorado National Monument, over the Redlands area, over downtown Grand Junction, along the Colorado River and over the farm lands of Fruita. If you want to go over your house (airspace and time permitting) we will be happy to oblige. Just tell us what you have in mind and if there’s time, we’ll take you there. We will discuss with you a “menu” of possible places to go before your flight. Why can’t we do any aerobatics (loops, rolls) on my flight? If you have not specifically pre-arranged an “aerobatic” ride, we cannot perform stunts. Loops, rolls and other aerobatic maneuvers are FAA prohibited unless a number of safety and legal requirements are first met. You must let us know in advance if you want to change an existing non-aerobatic ride. We need you at the airport no later than 15 minutes prior to your flight time. Please schedule your ride by calling 970-261-4220 as far in advance as possible to allow for the best selection of times. We fly most every weekend from May until October and a number of days during the week as demand dictates. Weekend reservations are often tightly booked, so you should try to schedule a week or more in advance. On weekdays, we can usually handle your request on shorter notice. 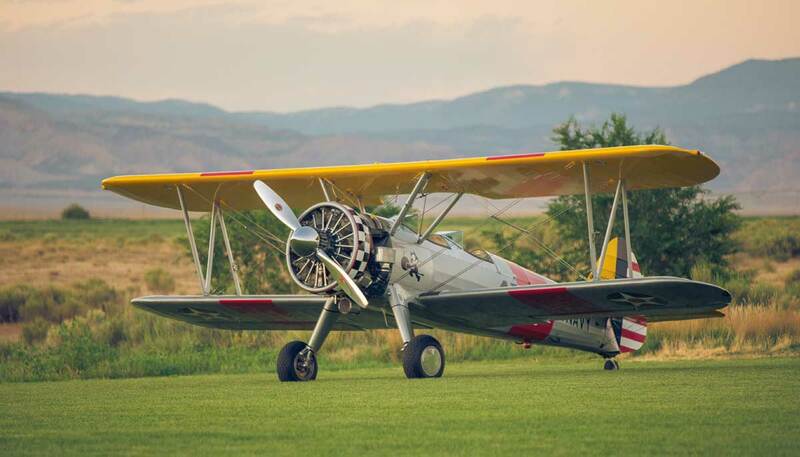 Remember, you can add time to your ride or change it to include aerobatics (loops, rolls, all the wild stuff), but you must let us know at the time you schedule. While it’s certainly not expected, many of our customers are so thrilled by their flight, they just can’t resist a small contribution to their pilot’s favorite charity – his airplane maintenance fund! Yes. Call Randy at 970-261-4220 to discuss. Call us anytime you want. On weekends, you will probably get our voicemail because we are up flying. Leave us a message and we will ALWAYS return your call ASAP. If this is a surprise, let us know who to ask for, where and when to call and we will keep it a secret. We fly most every weekend from May through October and weekdays by appointment. Call us and we can email you or the recipient a Vintage Aviation, Ltd. gift certificate. Yes, by calling 970-261-4220 and asking for Randy.